I have teamed up with Bugs and Beans and bringing you an amazing Giveaway for spring! Hotter Shoes is a great company who is offering one of our readers One New Pair of Shoes from their New Spring Collection! Shoes are so awesome and there is no such thing as too many! What a great way to bring in the new season! I don’t know about you but a brand new pair of shoes for spring is on my wish list?!? I can’t think of any better way to get the shoes then by winning them! To find out more about Hotter Shoes you can check out my full review. Now onto the amazing giveaway! 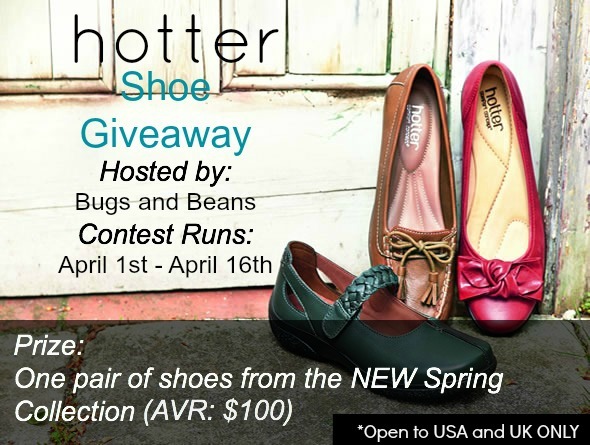 Enter to win a pair of shoes from Hotter Shoes New Spring Collection! You must be 18+ and this is open to USA and UK ONLY! *Disclosure: Tales From A Southern Mom is not responsible for sponsor prize shipment.This giveaway is in no way sponsored, endorsed or administered by,or associated with Facebook, Twitter, or Pinterest. Next post: RootBizzle Tie Club Giveaway! I learned that its Britain’s favorite comfort shoes!